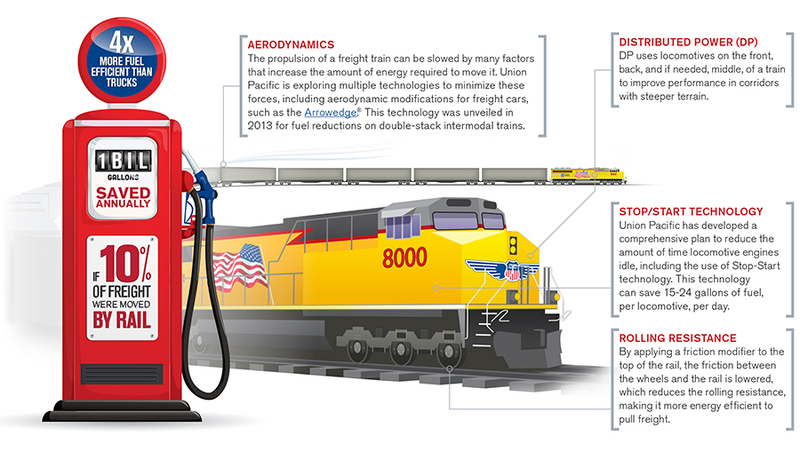 Union Pacific's 2013 Sustainability & Citizenship Report recaps efforts in safety, community development, employee engagement and environmental preservation, including fuel conserving technologies identified here. Omaha, Nebraska, May 30, 2014 /3BL Media/ – Union Pacific’s 2013 Sustainability and Citizenship Report outlines the company’s progress in the areas of safety, community impact, employee engagement and environmental preservation. For more information on these initiatives, and an overview of Union Pacific’s goals as they relate to supporting the nation’s imminent and long-term freight transportation needs, review the report at www.up.com. Watch a video celebrating Union Pacific employees at work, helping keep America moving. Union Pacific Railroad is the principal operating company of Union Pacific Corporation (NYSE: UNP). One of America's most recognized companies, Union Pacific Railroad connects 23 states in the western two-thirds of the country by rail, providing a critical link in the global supply chain. From 2004-2013, Union Pacific invested approximately $30 billion in its network and operations to support America’s transportation infrastructure. The railroad’s diversified business mix includes Agricultural Products, Automotive, Chemicals, Coal, Industrial Products and Intermodal. Union Pacific serves many of the fastest-growing U.S. population centers, operates from all major West Coast and Gulf Coast ports to eastern gateways, connects with Canada's rail systems and is the only railroad serving all six major Mexico gateways. Union Pacific provides value to its roughly 10,000 customers by delivering products in a safe, reliable, fuel-efficient and environmentally responsible manner. Union Pacific media contact: Elizabeth Hutchison at eehutchi@up.com or 402-544-8433.